Welcome to Greg Goodwin Construction, Inc.! Greg Goodwin Construction has been in the home building business for over 21 years serving Niceville and the surrounding areas, including Destin, Santa Rosa Beach, Seagrove Beach, Freeport, Bluewater Bay and Fort Walton Beach, Florida. Greg Goodwin homes have earned the reputation of being some of the most creative and highest quality homes in the Niceville, Florida area. Greg attributes the success of his business and his outstanding reputation to the quality of service that he provides homeowners on a daily basis. This level of quality is maintained through multiple daily inspections of each construction project and a trusted team of sub contractors that have earned the trust and respect of Greg Goodwin through years of loyal and exceptional service. Greg Goodwin has been involved in the construction industry most of his life, as he began helping his builder/developer father at a very young age. From driving bulldozers at age 12 to being an accomplished frame & trim carpenter at age 23, Greg gained valuable experience while learning every step of the construction process from the ground up. In 1985, Greg and his wife started their own business and incorporated in 1989. Greg has been constructing quality well-built homes ever since, quietly and steadily building his reputation, relying mainly on referrals and recommendations from previous customers. 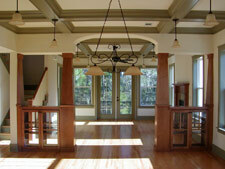 Call 850.678.3396 or click to contact our Custom Home Builders. Serving Niceville, Destin, Santa Rosa Beach, Seagrove Beach, Freeport, Bluewater Bay, Fort Walton Beach and the surrounding Florida areas.